Over the past week I got to play tourist with Doobie’s family visiting. As a local a trip to the theme park more often only lasts a few hours so I love whenever I have the chance to just go to the Disney theme parks day after day for full days like most tourists. And I always learn something new. Here’s 8 Random Things I learned this week as a tourist…. 1. The France Pavilion’s pastry shop is well worth the wait and lack of seating. If you are very lucky you may find an open table just inside the air conditioned retail shop at its exit. But based on my experiences the past week I think finding any spot to enjoy those delicious pastries is lucky. I also learned that its nearest bathroom is in the Morocco pavilion so I can see planning in the future to grab a dessert in France and then heading over to the Tangierine Cafe for a lamb wrap plus I never have trouble finding a table at Morocco. 3. 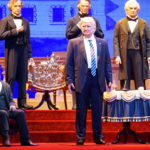 The Magic Kingdom’s Hall of Presidents is losing its dignity. 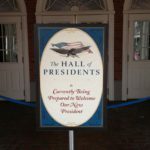 During the Presidential roll call a large burst of applause accompanied the announcement of President Lincoln (the first to receive audience applause). 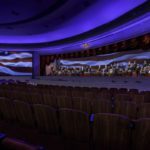 Then a few random presidents were cheered by select audience members until we got to the more current generation of presidents where John F Kennedy and Ronald Reagan received strong responses, but his successor George Bush was met with silence and awkward giggles. Presidents Bill Clinton and George W Bush received similar audience responses and when our current President uttered his name in the Oath there was a tremendous cheer. The audience applause drown out the opening words of his brief message as well. I’m wondering if perhaps in the future the presentation will need to be paced differently and maybe even feature a request to hold applause until the conclusion. 4. If you are not a parade fan, plan to see the Kilimanjaro Safari part-way through the Animal Kingdom parade presentation. We walked directly onto the attraction and were offered to stay aboard when we reached the station. A new sight to me, a hippo out of the water. 5. Photopass is not just for a fun theme park photo anymore. They offer packages at select resorts now. As it was explained to us, for $100 you can have a 30 minute photo shoot around the resort. The package includes the rights to a cd of the images taken during the photo session. Other priced packages may also be available. Considering how many family reunions, anniversaries, weddings celebrated at Walt Disney World this seems like a fantastic idea and compared to the cost of a formal studio photo package it seems like competitively priced alternative with a more picturesque but less formal setting. I’m thinking about getting my own family photos this way now. It will be nice to have a family portrait where we don’t look quite so theme park visitor like we do here but will still feature a Disney environment. 6. If you lose a child at the theme park, do not panic to the point where you are unable to provide cast members with a description of your child. Follow the direction of the cast member you approached as they do have specific protocols in place to best assist you in a speedy reunion. I was in the baby care center when a hysterical mom came in looking for her son. She frantically told the cast member that her son had called her on a cellphone telling her where she was but she didn’t know where that place was. She didn’t answer any of the cast members questions about her son’s appearance and after a few moments just declared that she would go look for him at the safari and left. By the way, Disney was still able to reunite them within about 15 minutes. 7. Buses can be fun. Automated messages on the Walt Disney World buses celebrate some of the new fun at the Magic Kingdom. On our trip we were requested to stay on our “best royal behavior” while on the “coach” because a princess was on board and we were also reminded to “keep to the code” when pirates were aboard. They also offered a special welcome to “first time guests” The messages were cute. 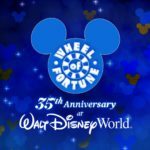 I’m still surprised that Disney didn’t have various special birthday celebratory songs available to their cast throughout the resorts. It gets kind of old singing “Happy Birthday” each visit as there is always someone in our restaurant celebrating. Our group was too big for a single auto so while Doobie took some of the group to the store in the mid-afternoon I played tour guide to the Resorts, knowing the buses would be fairly empty this time of day. We took a resort bus from the MK to Animal Kingdom Lodge and briefly enjoyed the animals there. Then hopped the bus to the Disney Studios, catching a glimpse of the Blizzard Beach fun because it makes a brief stop there first. We walked from the Studios to the Boardwalk, took a gander at the lobby then headed by boat to the Yacht & Beach Club where Doobie picked us up. It took us about 2.5 hours. 8. Having a baby changes my theme park experience in ways I didn’t anticipate. For example did you know that the bathrooms by the Yakitori House do not have a changing table in either the men or women’s restrooms? I do now. I also discovered the table and chairs at entrance to Le Chapeau is a fun place to watch Spectromagic with a little, little one. It has easy access to beverages (the Candy Shoppe), the bathrooms at Tony’s and is off the highly trafficked path so we could more easily keep him entertained as we waited. I think some of the a/c keep it a bit cooler as well. I was even able to spread a blanket over the little porch by the storefront window and let Gideon play there for a bit. When the parade started we were able to walk up closer to the parade if we wanted or stay back in our comfortable seats. We could see Mickey and other characters as the parade passed by. Gideon watches Mickey pass by in SpectroMagic. We’re standing just in front of the little porch. Finally as we exited the Magic Kingdom I discovered that its best to be on the far left side of the Ferry loading along the “stroller lane”. They load up a select number of strollers each ferry and its much easier for both you and the little passenger to be in that portion of the queue instead of the main loading area. Also once aboard the water vessel you can disembark easier by staying in the center rather than being along the outer wall.